My husband has encouraged me from day one with every dream, hope, and frustration. He has an amazing intellectual mind and a kind heart towards people. But, I want to tell part of his amazing story right now because there are a lot of people in the US who are having a hard time right now. It is "layoff time" again. A little over five years a go, the Monday before Thanksgiving, my husband walked into his incredible civil engineering job of four years to find out that they were "right sizing" and he was on the wrong side of the size. So, that Thanksgiving, we were thankful for our family, our home, and everything, and yet, we were heartbroken at the uncertainty -- he had 12 weeks to find a new job. I know amazing people who get laid off and my husband is the most amazing person I know. We prayed and prayed on our knees and what we felt God was telling us was that "God never gives demotions, only promotions." So, we held to that. It took the FULL twelve weeks to get on with another company. Yes, he had TONS of offers to move to Atlanta or Tallahassee or other places to be an engineer, but he wanted to keep us in rural Georgia. And trust me, in rural Georgia engineering jobs definitely don't grow on trees - pecans do! So, he stuck to it. He started with an incredible company down the road and during the last five years -- he has been promoted SEVEN times. He is now manager of engineering and reports to the plant manager. What to do when hard times hit: NEVER QUIT! And yet, for all of the blessings of the past five years, if he had just given up like a sailor lost at sea and gone down -- it wouldn't have happened. There was a teetering, hopeless moment when he looked into his life and instead of choosing to see the abyss of despair, he saw the vacancy that would make room for future success. I don't think I'll ever say that the best thing that happened to us was him getting laid off, however, it was FOR our best. Kind of like pruning shrub. The poor shrub looks dead but it is getting ready to grow like crazy. So, for those of you caught up in uncertain times, take hope. And as we also again deal with the uncertain times in manufacturing and say "Oh dear, what if his plant closes?" we again know that we are the the hands of the Great Engineer of life and will be able to make it through. Honestly, there is not one thing I want for our anniversary except one thing. I pray for my husband to last a long time with great health so that he and I can grow old together and hold hands in the nursing home and chase each other around in our walkers. I really just want him. That is it. Because all of this other stuff is just stuff, but he is someone that cannot be replaced ever. He stuck by me when I was terribly sick when I was pregnant with all three of our kids, left a high paying job to be a stay at home mom, and left another great job to teach. He encourages me to travel, meet people, and live my dreams. And as I think of Kip, I honestly cannot think of any time he criticized me directly. He has always been kind and loving to me -- like a big tough bear gently holding a glass orb to the light. To say I'm blessed is an understatement, but I also want to say this. I think I love the stories of people who overcome horribly tough circumstances because I can say from experience that the toughest times of life do take a toll on marraiges. During tough times, I'm not a Pollyanna laughing through the back yard -- I get horribly down. I'm crabby and kind of depressed. And there were times, I know for a fact, Kip had to remember that he decided to love me, because when I was so terribly sick -- I was NOT a lovely creature! How does this relate to education and teaching? I recall the chapter in Ken Medina's amazing book Brain Rules: 12 Principles for Surviving and Thriving at Work, Home, and School (Book & DVD) and how he talks about the negative impact that stress has on the brains of children. He cites a marriage health program that has amazing results and talks about the positive impact on education that improving marriage and home stability would have. When parental instability is in the home, the stress on children causes grade instability. It just does. I don't profess to be a part of a perfect home, but if there is something that I have learned it is this... love IS a decision if you're going to have a fifteen year anniversary. I always say that I'm the luckiest woman in the world because I get to be married to my boyfriend! But I also teach my own children that most great things in life require a lot of hard work and persistence -- and this includes marraige. If I had been told fifteen years a go that I'd be writing something like this on a thing called a "blog" and that someone out there might actually read it, I would have laughed. So, Kip, if you're reading this -- the air conditioner man just fixed the air conditioner (so you won't be sleeping in 86 degree heat tonight), the knob for the washing machine just came in (so I can wash your clothes again), and I couldn't be prouder of any man on this planet that I am of you! Don't bring me flowers... just bring me YOU! Happy Anniversary! It is so helpful to get feedback like this. I just did a pd session yesterday and think perhaps it should have been more hands on like Julie and I did at NECC. I love this feedback. NECC Ustreamed Presentation: Ramapo Island Students Rock the House! One of my favorite educational innovators, Kevin Jarrett, shares the ustream of Peggy Sheehy and her students sharing what they are doing in Ramapo Island. Listening and learning from Peggy, Kevin, and Beth Ritter-Guth has caused a personal shift in my own mind about the efficacy of virtual worlds. We're planning to introduce an island this fall for use in Flat Classroom and digiteen. I'm so glad for the ustream because I was in the room next door with the viral PD session and really needed to hear this. Boy, I have a lot to learn! Isn't it great to be able to collapse the float in sharing best practices like this? This work is also backed up by the research Chris DeDe shared at NECC about Rivercity. Also, remember, that there will never be a "magic pill" that makes teaching easy and learning a piece of cake. If we ate cake all of the time, we'd be sick to our stomachs! But we can add additional tools to our toolbelt that accomplish different tasks and create deep learning experiences which require problem solving, imagination, and content knowledge. Thank you, Kevin for ustreaming this one! Freemind mind mapper tool. Want to play with this one. A list of some new "up and coming" blogs -- some I've heard of and some I haven't. Will be perusing this list. Wow! Kristin Hokanson has compiled some amazing digital storytelling resources on this page including some great multimedia. Incredible resources! "No matter how cool the technology tools, culture, I believe, will win the tug-of-war. There still may be a few trailblazers but systemic buy-in is likely to be minimal. I believe culture ensures the sustainability that Michael Fullan talks about." 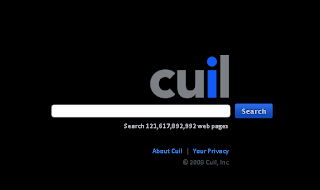 Cuil launches today from some disenfranchised Google Employees, according to the Associated Press. In the article, founder Anna Patterson says that Google has looked virtually unchanged for the last 10 years and talks about the magazine like spread of the search. 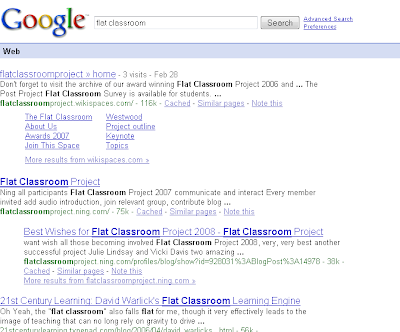 After I searched for "flat classroom" I got this page that said it had "14,431 results." When I search Google, this is my result of over 4 million results. When I compare the two -- the top two on Google are actually from the project itself. Then, on the Google engine there is a 2006 post from Sheryl Nussbaum-Beach that uses the term "flat classroom" and is highly linked, but really, it is not too current. Then, on Cuil, the wiki isn't even indexed. (I have a feeling that wikispaces isn't there yet.) However, the Ning does show up with an interesting graphic on the top left corner that says "My Success in Scientology" -- it says the image is coming from the Ning, but I cannot find that image anywhere. I really don't like the image and wonder if it is advertising, but yet, clicking on the image takes me to the ning. So, although including a graphic is nice, it should be relevant and from the proper site. Just basic preferences are available here. Here, they claim to be the biggest search engine. But they also do not collect information about users. A concept which many have criticized Google for doing. 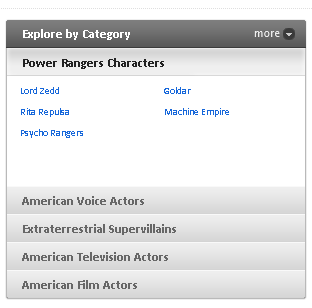 The suggested categories seem pretty random as I'm not aware of Vicki Davis being a power ranger, although some might agree with "Extraterrestrial Supervillains." They also seem to have not gotten down the spacing and algorithm thing down yet. 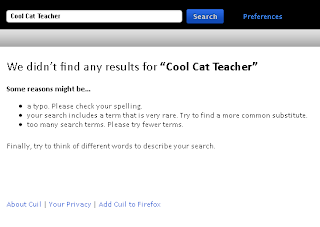 When I type in "coolcatteacher" it finds my profile page and page on twitter, however, when I type "Cool Cat Teacher" -- it finds Nothing! It doesn't seem to have indexed some of the sites I really like to browse like Wikispaces. Also, as I browsed through their site, I found that their Faq's page was available and then not available. 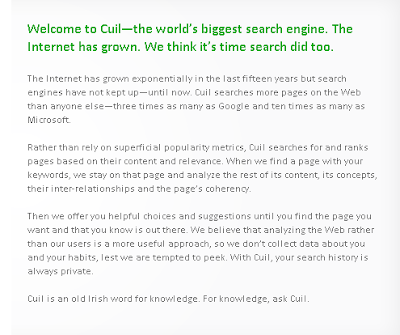 OK, so after all of this, what is my "take" on Cuil versus Google. I love the idea of tabbed and category searches -- if the tabs and categories are accurate. I also like the idea of not feeling like anyone is looking over my shoulder. With a highly capitalized start up, surely this site will evolve rapidly. For now, it seems there are whole swaths of the web that are not pulled into the index (eg. wikispaces). The spacing and capitlization algorithms don't seem to be there yet either. So, for me, Cuil is something new to add to my firefox toolbar search (just perform a search of any kind in Cuil and you can find the link to do this) but is not a replacement for my iGoogle start page. Honestly, I don't know of anyone that starts up on the Google home page itself -- Cuil should really make an igoogle widget of its own. Also, its claim to have more pages than Google when it is not quite up to snuff yet is going to hurt its credibility in the long run. I'm not sure why they didn't launch in "beta" so that we'll excuse the hitches and glitches, but they didn't. It is one of those wait and see kind of things. But for now, keep an eye on Cuil. Jonathan Trenn writes an article on the "fallacy of community" that many of the vendors at NECC should read. Edubloggers / educators/ educational groups of people emerge because we want to. We create a community when we need to and have the passionate desire for a common purpose. However, the word community and social network was so overused at NECC this year as to become a curse word. Used by people told it was important but who may not understand it themselves. This is a great article and strikes a cord with me. Twitter counts of following and followers may change as they "fix" things in twitter. Just part of the growth. Virsona is sponsoring a talking history contest in which you create a virtual person that answers questions like the person in history would answer. This could be a great excercise for a history class if you have characters that you investigate deeply. This would be fascinating. Susan Etteneheim uses Google Sites for her school and set up a customized start page for students in her school using google sites. Very nice work. Another group of teachers is forming to talk about flattening the classrooms w/ their students who are under age 11. This discussion is open to anyone who joins in. Feel free to join and discuss here. Grassroots movements to connect such as these are cropping up everywhere in many places, not just here. But this is a model example of how it is happening. These are "teacherpreneurs" in action! "I’ve always valued problem-solving, decision-making, and higher critical thinking skills in my classes. I know that 7th graders are a bit wobbly in their emerging abstract thinking skills, but I also know that a little scaffolding and creative empowerment helps those new skills flourish! Learning how to learn and learning how to think are two of my top goals for each of my students." I love this quote from Amy Dean about what she wants for her 7th grade students. Amy has a very nice blog, reflecting pools. "The currency of youth is time..."
I enjoyed the reality that James Gill shares his experience teaching summer schoool. From the tremendous investment of time (and advice from his father, a retired science teacher), to the kids who just tune out and move on. THIS is what teachers who teach summer school deal with. I admire James for his tenacity and positive attitude in the midst of struggle. "As I say below, in horribly confused prose, danah’s presentation of her research on teen networking practices made me question whether teens are as impressed by the potential of global collaboration as we (rightly) are. I’ve gone through two of them now, and am fairly certain that once the unit was over, so were any connections that those teens made with other teens flung wide around the globe during that unit." "Global collaboration works keeping one vital factor in mind. Teacher engagement PRECEDES student engagement. Some projects just want to throw kids together and don't have meaning for the students. Connecting globally isn't easy. It is very challenging and I think it best happens when you start with say two teachers and two classrooms with a meaningful project and then on from there. There will NEVER I repeat, NEVER be a "magic pill" for education where teaching just becomes easy and kids just do it themselves. It doesn't happen in our flat classroom projects nor does it happen in any course I've ever taught. That being said, when global collaboration is done well and when teacher engagement is high -- the learning that results is permanent and transformational -- at least that is what I've seen. I don't like the term "social networking" for education and prefer "educational networking" -- by mixing the two up in research we're getting some sort of bastardized results that don't really reflect what we're talking about. Also, remember, that we must work to do age appropriate, class appropriate, learning style appropriate projects and teaching. And that all of this is very very hard work. No magic pill here -- however, I can 100% say that my students would not have the same result collaborating with just schools in Georgia as with schools around the world. Finally, there are ways to flatten the classroom by working with people in the community -- just check out what Ernie Easter in Maine is doing with his project to create online virtual museums with several community organizations. Flat comes in multiple flavors, but it must be meaningful and requires teacher engagement." I don't really know who among us has the perfect formula... yet. However, I also have to wonder if the imperfect nature of collaboration and the whirlwind of teachable moments that it entails is not also an essential part of learning about the Flat World. I still think we are just at the beginning of this entire process of flattening the classroom and we need to be careful to think that any one pattern is the absolute right one. To me it is about removing the walls of the classroom and about providing meaningful, authentic projects where students are allowed multiple methods of production and response. Creating researchers with a strong thought process who understand the technology trends shaping our society and an awareness of cultural differences and how to work with multi-national collaborative teams towads a common purpose... these are the things I strive for in my classroom. Still finding this handy tool a nice augmentation to the growing micro-blogging networks. Fast ways to connect -- this tool helps it happen in addition to twitter. If you had to pick one, I'd say twitter, however plurk is very intimate with friends gathering around a little conversation like buddies around a summer campfire. New York Times Podcasts -- many of your favorite papers have podcasts -- subscribe over itunes. This is how I listen to the WSJ -- adding a few New York times podcasts too. I've done interviews with my daughter and recently shared what I'll be doing this fall. When I get really busy and don't blog as much, I do more podcasting via my cell. The quality isn't great, however, I often listen back to thoughts as I'm blogging to help capture things I'm pondering when things are busy. Hope you have a great week -- enjoy whatever summer you have left for those of us on the top of the globe! The Handbook of Technological Pedagogical Content Knowledge for Educators (TPCK) is now available via wiki. Looks like some excellent resources and research articles here. "At the highest level, we are looking for non-routine problem-solving skills. We expect applicants to be able to solve routine problems as a matter of course. After all, that's what most education is concerned with. But the non-routine problems offer the opportunity to create competitive advantage, and solving those problems requires creative thought and tenacity." I like the creative thought and tenacity part. So very often I push my students to solve a problem and WILL NOT tell them the answer. I give them the next step, but what am I honestly teaching them if I go and fix it for them. In this case, I could have said, "just post the link and I'll grade it that way." But no, the assignment was that it HAD to be on the Ning. I have to have everything in one place for a variety of reasons, at least to encourage peer review. I gave a very general assignment to create a blog post, podcast, movie, or multimedia artifact of your choice about a new technology that you have discovered this summer. She determined what she would do. I'm finishing up a book that I hope to be out in August about just this very thing: how to teach students HOW TO LEARN new software. So, do your students major in learning? Do you point them in the right direction but teach them problem solving skills? AND -- do they have the TENACITY to continue. This persistence and willingness to work very very hard is something that many are lacking. You can have an engaging classroom that is also a challenging classroom. Engagement and Web 2.0 tools are not synonymous with "easy" -- not by a long shot. In fact, for the best teachers their classes are engaging and "tough" as the students say. What are the other characteristics Google wants in these "non routine savants"? To me, this is the sort of thing the Flat Classroom project, Horizon Project, and Digiteen projects inspire. What do you think? What does Major in Learning look like? Google docs just launched templates which includes a whole section for students and teachers. Some very cool things here, although still not MLA paper. Google Docs just launched templates. This will be very useful. Marco Torres' student presentations and videos. Excellent digital storytelling examples to review. Marco Torres' wiki page with media and information on his student projects. He teaches in LA. Michael Torres presented a fascinating Session at BLC today about how he engages students using multimedia. This is his page and it has some great work on it. He used music to introduce algebra. It was very cool. This is for my Aunt Vicki. You see, I have always had some very big shoes to fill -- I was named after numerous people. However, my Aunt Vicki, my Mom's sister is "Big Vicki" and I've always been "Little Vicki," long past when I was little! Aunt Vicki is like the sunshine on water -- her laugh fills up a room. I love her dearly. She has always loved me unconditionally. Tonight, I am praying for my Aunt Vicki because she is in ICU recovering from a stroke. She is quite young to be there and yet, she is. She and my mother are both walking, talking evidence of the grace and goodness of God. "My grandfather was the kind of guy to always be smiling & laughing - when he was dying of cancer I saw that disappear - so in the middle of ICU with all the nurses & doctors around I got down on 1 knee & sang this song to my grandpa - For those that have not had the misfortune of hearing me sing I can't - I went for it all even the last note - to see a smile widen across his face - hear him laugh for the last time saying don't give up your day job - it was worth the embarrassment 100 times over"
It is the reckless abandon and humility in loving your family that endears me to this commenter. Life is so short. We do not know who we have today and not tomorrow. xCrimsonButterflyx got it right. "If something were to happen to __(fill in their name)____ tonight, what would be my regret?" Then, set out to fix it. Life is so short, so fragile, so temporary, that we must love our family while we have them. I wish I'd visited her more. But then again, I just thought I had forever to go skiing with her at the lake. I am so wrong sometimes that it stinks. Indeed, each moment is beautiful, each breath is a gift, and each memory we make is one we keep. So, tonight as I retire, I sing to myself the song, Hiding place, sung so beautifully by the vlogger I found below. For truly, tonight as my family and I circle up in the prayer room of our church, He is our hiding place. And whatever lies ahead for Aunt Vicki and us, we know Who holds the key and her and our future. Thank you all for your encouragement today over twitter and plurk. I'll keep those who want to follow this updated on this page. A ButterFly Kiss - http://flickr.com/photos/66179962@N00/989153341/ TIO's photo Stream. For those who are plurking out there, this plurk mobile sidebar makes it easier to have a conversation. 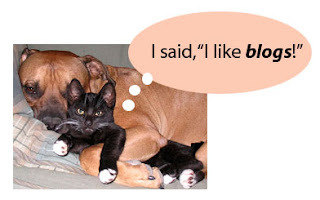 I find it interesting that some are just getting used to twitter, however, plurk has the benefit of microconversations. Twitter is just one huge conversation! I enjoy both for different reasons. Somehow plurk feels a little more intimate! "I found the Steampunk movie below, from Alice, as beautiful and enchanting as many of the 'real' movies I've seen recently"
After defining the word steampunk, (ok, I'm sure it was back in some dusty neurons somewhere), I was totally floored that this number was indeed filmed in Second Life. As I'm embarking upon a Second Life island of our own this fall (and honestly, have no clue as to how it will work out, just that I have some really smart friends to call upon,) I'm amazed at what these worlds let us do. It would take days of animation which would still pretty much leave this quality of filmmaking unreachable at the K12 level and yet with some screen capture software like Camtasia, we can indeed do some amazing things. The idea of machinima is really just now beginning to take hold in the minds of educators and yet, the more I think about it the more I think it can have great value to us in many more ways than creative writing. After spending some cursory time looking for information on this topic, I was amazed at Diane Carr's excellent overview of the research and activities in this topic in her Machinima in Education article on the Future Lab website. I'm going to spend some time reading the resources and information there. Third person is such a valuable role for students to play as it releases them from the peer pressure of "looking dumb" when they act in front of a room of people. This is on my hot list to investigate for the fall. What are the best practices when capturing machinima? Maybe you have some links to share. If you are on linked in, we now have an edubloggers group. This allows you to contact other edubloggers directly. Right now, I'm moderating those who want to join, but could use some help. Please join in! Medievia - Do You Dare Enter? Another immersive world that is largely text based. Do I dare enter? Who is joining or has played? Group tagcloud for diigo group -- another useful thing. The educators group on Diigo now has a linkroll which will allow you to share things. The power of this is that if you are a science teacher, you can filter everything and only share science. Same for all subject areas. The twitter address that lets you follow new additions to the edublogger directory. Cool Calendar of education events. I'm adding this one to my google calendar. Great newcoming blogger. EstieC uses hyperlinks very nicely and has a nice writing style. Here, she reflects on the importance of commenting and is also part of one of the best pd projects that I've seen in a long time: the 23Things project out of Atlanta. A great model. Nice blog post overviewing some of the great rubric generators out there now. There are a few here that I hadn't heard of. Linked in now has groups. I think linked in is important for professionals and doesn't have the "I'm looking for a job" feel of Monster. ISTE has created a group on linked in. Feedback from people about what they use to manage their lists and calendar. I'm loving remember the milk, google calendar, and jott, they are like the 3 amigos of time management for me now. Love timebridge for setting appointments. PBS teachersa is adding social networking and bookmarking tools. You can create a personal profile on pbs teachers connect now. This article talks about it. Still wish we'd call it educational networking or professional networking depending upon what we're doing. Earnie Easter's blog over at the Seedlings Ning network. This is an educator to watch. His work is amazing. Again, legislators determine what should be taught. Algebra is so important but not sure it should come from legislature. Would like to see more empowerment and bottom up improvement. Top down improvement also means one more awful thing... more paperwork. Amazing student project to create memories and artifacts. This is an excellent partnership between the New Sweden Historical Society, Stockholm Historical Society, Maine Swedish Colony, Nylander Museum, New Sweden School, and others. It is time for museums and schools to begin partnerships in this way. What meaningful, authentic work. Wow! From Earnie Easter via e-mail today. Earnie Easter's students from Maine helped digitize the artifacts in "new Sweden." The Maine Memory Museum has used their students to help digitize and share the information. This is such an amazing project. This middle school 1:1 learning program in Maine has been named one of the best. here is some information on best practices and a video about it that I'll be reading and learning from as we discuss this at our school over the next year. "The presenter, Konrad Glogowski, an eigth grade writing teacher, discussed his use of blogs as a "third place" for students to express themselves. The first place being students home, the second school, and the third, a sort of place where they are free to creatively express themselves. At the begining of the year, Mr. Glogowski challenged his students to "grow" a blog. He presented them a visual to assist them in planning their creation and, pretty much, allowed them the freedom to make their own product. He watched as the blogs and classroom community grew. Fellow students commented on one another's blog entries, offering advice and building fellow classmates confidence in their writing. Mr. Glogowski's role as teacher evolved into a reader of work and a partner in learning rather than an evaluator and expert of information. By the end of the year, his students had great pride in their work, bonded as a communtiy, and were better, more confident, writers. The likely hood that they would continue to work on their blogs and writing was extremely high. Mr. Glogowski's strategy and his educational philosophy towards blogging was a success." This person did not attend necc, but watched Konrad present via ustream via Will Richardson's blog. Ascyhronous conferences are so important. Can we make it part of conference best practice? Great discussion on the Flat Classroom Ning (anyone can join) about the next three items we will each do. Some shared on the ustream and some over here. Cool 3d mind mapping software availablef or free. This is fascinating. This great shirt from Al has me rolling. He's set it up so you can order one yourself. See his blog for how he did it on Zazzle. I'm really beginning to enjoy Tara's blog. Tara is in China and is doing a very nice job of sharing information and making clear, insightful blog posts for beginners. Great job, Tara! It has been quite disturbing to me that I'm getting an increasing number of people telling me that they are sending comments through to me and I'm not getting them. I appreciate Miguel Guhlin sending me an email and asking about his comment because until this point, it has been in casual conversation that people have mentioned it. It has been at least six people that have told me in the past few weeks that their comments are not coming through. So, I need your help. I think that sometimes comments with hyperlinks are getting flagged as spam. I do get some with hyperlinks so I don't know if there is a pattern, if it requires a lot of hyperlinks or what causes this. I also wonder if it has to do with time of day or use? If a lot of people are trying to comment, does it choke? I would like to contact the people at google, but to do this, we need facts. If you happen to read this and your comment WASN'T published the first time, I'd love to know about what time it happened and (if you remember), what post it was. I have no idea how much of a problem this is on my blog. I may find it is a HUGE problem. I just don't know. What comments do I publish? Unfortunately, I've had death threats and people who just plain hate me (including a recent post.) I've always made it a habit of posting these because as much as it may hurt, it is important to model this for others. If I never had anyone disagree with me on my blog, you would think I "sanitize" the comments. I don't. Period. Unfortunately, there are some out there that instead of asking me, just jump to the conclusion that I don't publish their post. Thank you Miguel for modeling such great behavior as in asking me if I got his comment. I didn't. I'm frustrated and need some help here. How much of a problem is this? Is Blogger throwing the good stuff out w/ the spamwater? It is hard to share all comments. Ugly comments hurt. I take things very personally when they are personal comments. However, I'm called to this and ultimately I live for an audience of One. It is Him I must stand before one day and when I feel like a terrible person, that is what I have to come back to. We all want to be liked but that is just not possible. I was totally overtired after NECC and posted some things that I regretted later, so I went back and removed some things from the post (as I said at the top of the post.) My word choice was seriously lacking and I let my issue with two people at NECC color my entire wording. That was wrong. It was the wrong way to write it and the wrong thing to do. I hope that this openness with the emotions I feel and the struggle with this part of writing for a global audience will help others who struggle with the same thing. We were talking at NECC over dinner about those who hurt our feelings and I had a great conversation with Jon Becker (Educational Insanity) and Scott McLeod. It is interesting, from the hundreds of commenters, each of us can name the specific handful of comments, posts, and people who pointedly, specifically launched personal attacks on us on our blogs. We can name some of the great comments, that is true, but we discussed how it feels when someone launches an attack against, not our ideas, but us personally. It is so important to know how to disagree professionally. It is also important to know that we color our thoughts of people through our own lens. We're not going to "like" everyone and everyone is not going to "like" us. That is OK. I hope by educating students on how to disagree with ideas while still being kind to the person behind the idea, that some people can be spared the feelings I felt so poignantly today when one unkind person practically undid all the kindness from last night. Some of my friends said to take down the comment, however, for now, I'm leaving it. It is a reminder of what I hope not to be. Maybe it makes me look like a terrible person. It certainly made me feel like a worthless no good. If you knew how I was raised, you'd know why, but you don't. You just see what is here, that is it. Please help me fix this problem on commenting. And remember, if you have a question you want to ask ME personally, I've always been open about sharing my email. coolcatteacher [at] gmail [dot] com. Reach out to the person before jumping to conclusions. I also appreciate emails about bad typos instead of publicly telling me I'm dumb for mispellings, but I publish those comments too! Thanks. I really enjoy this information from Silvia tolisano about Mixbook -- it is part 7 of an amazing digital storytelling series. Talking about expanding boundaries and what we need to do. Technology in the Middle » Blog Archive » Are You the Obstacle or the Answer? I adore this post about being the obstacle or the answer from a participant in the workshop on Monday. These insights are excellent and this school MICDS has some of the most visionary, progressive teachers and administrators! It is refreshing to be here. Elizabeth Helfant, their IT director, is unbelievably sharp! Totally amazing woman with the energy of the Energizer bunny. Wow! Here is a page that has an embedded science report that se used docstoc for. This is a great example. From Julie Lindsay's class. Amazing wiki portfolio from one of Julie Lindsay's students. wow! Look at the science report that she used docstoc to upload. A classmate in our workshop has created a group for researchers who want to research web 2 -- if you want to join a group, Craig has just retired from the Navy and has a LOT of energy! Leigh Newton director of IT at a school in Baku, Azerbaijan wants to talk about linking his grade 5 classes of about 30 students to others in the world. There is also a PYP (Primary years program) on the flat classroom ning about this. Some interesting conversations are emerging. If you're interested, join and join the conversation. The original plurknovela -- look at it. Join in the plurknovela. So cool. This is the original one. Plurk novellas are emerging -- this is very cool. This could be used in writing. You can see how threaded microblogging is DIFFERENT from twitter. I think there is room for both. This is the video on the "flipped" class structure. Wow! Some cool science teachers at necc who have "flipped the classroom" -- they record their lectures and make them available on itunes to download. Then, they do "homework" in class w/ the teachers. Listening to the podcast of class is their assignment -- the homework is what they do in class. This flipped method had some people talking today in our workshop. So so cool! This makes so much sense -- take the one to many work delivery and make it the assignment -- take the work where you need many to many to help one another and have that in the classroom. Can you see class evolving? wow! This makes so much sense. I feel like an awestruck child looking at my first fireworks show. Who am I that such wonder should come my way? And yet, tonight, on wow2, I was totally shocked to have such kindness from many of you. You made a tribute to me of encouragement and kindness in celebration of the last night on the show as an official co-host. After a long day of teaching, I'm so exhausted, and yet, I've listened to every voicethread comment and looked at every picture on the tribute wiki. You have given me one of the greatest gifts I've ever received! In the voice thread below, I've truly recorded all of my thoughts to you and how I feel. Though spent, I am exhilerated. And, how on earth did it stay a secret? Thank you for reaching through the Internet and encouraging me. This is such a kindness! The educators around the world are truly a welcoming and noble group of people. I am happy to call you friends and colleagues. I've left a voice recording on the beautiful voice thread you've left and hope you'll take a moment to listen to the thank you. Of course, I'm not going far and still will be on the Internet at the Cool Cat teacher blog and sharing things at select conferences. I'm very grateful to the amazing edtechtalk.com channel -- the most amazing group of webcasters in education. I hope we can figure out a way for me to help in any way possible the amazing efforts of these pioneers in education. I plug the podcasts there every chance I get. Also, I encourage every educator who wants to webcast to join the webcast academy and become a Webhead. We need more webheads so we can have more podcasts. It is time for science, history, literature, languages podcasts to crop up. Share, Share, Share. We are much more together than we are a part. Of course, I will always, always, be a women of web 2 and am grateful for Jennifer, Sharon, and Cheryl and the many hours we've all put into making the show the very best it can be. I will remain a loyal listener and fan as they take it all to the next level and will continue to support the show in any way I can. Thank you for taking the time! Let me point this out. This wiki has touched me profoundly, so, what could you do for someone retiring in your school, district, or organization? Make a voicethread like the one that is here. I LOVE THE VOICETHREAD! It is a gift to the person and to their family. Everyone wants to know that they mean something, that they've left a legacy -- ESPECIALLY TEACHERS. What better way to do this than to have voicethreads to celebrate the work that they have done. The best way to thank me is to do this for someone else. I can tell you this, when people want to pay tribute to other teachers by leaving a voice thread message, somehow the whole thing comes alive. Learning to edit a wiki to leave a comment does something. I think this is a great thing to do for anyone you want to honor. The tears upon my cheeks tonight have shown me the power and gratitude that I feel. Because we can give thousands of plaques and thank yous, but it is the stories of those we touch that make our legacy. It is not about awards, it is about the lives we touch and the people who we've helped live better lives. Every good teacher deserves this. Thank you for not only affirming me, but in affirming to me the desire to pass on the feeling I have right to other teachers who deserve the thank you... and this world is full of them. Turn around and do this to thank another teacher or educator. I am forever grateful for this tribute, it is truly one of the pinnacles of my career. co-founder of women of web 2"
If it is possible for me to feel that words are insufficient, now is the time! But I'll say this, using these tools to honor the teachers among us may be the single greatest "happy accident" we've had in a long time. Try it and share it.